INTRODUCTION TO SPANISH GRAMMAR I No prerequisite. This course is designed especially for students at the beginning level of Spanish. It serves as an introduction to Spanish grammar and pronunciation. The course is offered in Spanish. Exceptions are only made when it is necessary to explain difficult concepts that the student cannot yet understand in the foreign language. The students should speak with the Resident Director prior to the course regarding the number of credits they will receive for the course. INTRODUCTION TO SPANISH GRAMMAR II No prerequisite. The course reviews Spanish grammar and some verbs in different moods including the indicative, the subjunctive and the imperative. The class is conducted in Spanish. Exceptions are only made when it is necessary to explain difficult concepts that the student cannot yet understand in the foreign language. The students should speak with the Resident Director prior to the course regarding the number of credits they will receive for the course. BEGINNING SPANISH I Prerequisite: SPN 111; two years of high school or a semester of college or equivalent. This course is the continuation of SPN 111. It is designed to improve the development of different aspects of the language: listening, speaking, writing and reading. The course content includes the following: regular and irregular verbs; the imperfect, future, conditional, imperative and subjunctive; pertinent vocabulary; complex sentence structures and various readings. The course is given in Spanish. Exceptions are only made when it is necessary to explain difficult concepts that the student cannot yet understand in the foreign language. 4 credits. BEGINNING SPANISH II Prerequisite: SPN 111; two years of high school or a semester of college or equivalent. This course is the continuation of SPN 111. It is designed to improve the development of different aspects of the language: listening, speaking, writing and reading. The course content includes the following: regular and irregular verbs; the imperfect, future, conditional, imperative and subjunctive; pertinent vocabulary; complex sentence structures and various readings. The course is given in Spanish. Exceptions are only made when it is necessary to explain difficult concepts that the student cannot yet understand in the foreign language. 4 credits. INTERMEDIATE SPANISH Prerequisite: SPN 112; three years of high school or two semesters of college or equivalent. This course is designed to improve the development of listening, speaking, reading and writing skills. The main objective of the course is to provide the student with enough pertinent vocabulary and grammatical structures so that he/she can converse and practice everything learned in previous courses. The content is as follows: regular and irregular verbs in all tenses, advanced vocabulary, structuring of sentences, and readings permitting an understanding of cultural themes. The course is offered in Spanish. 4 credits. INTERMEDIATE SPANISH II Prerequisite: SPN 211; four years of high school or three semesters of college or equivalent. This course is designed to increase the student's abilities in oral comprehension, reading and writing in Spanish, so that the students can communicate and practice linguistic models which they have already learned. Students make a figurative and symbolic analysis of language using readings and short stories and idiomatic expressions. The class is conducted in Spanish. 4 credits. COMMUNICATIVE STRATEGIES IN SPANISH Prerequisite: SPN211; four years of High School or three semesters of college or equivalent. This course is designed to further develop the student's skills in oral and written communication, as well as improve communication through description, narration, and the formulation of argument, hypothesis, suggestion and opinion. 4 credits. HISTORY OF MÉXICO Prerequisite: SPN 211; two years of high school or a semester of college or equivalent. This course provides a chronological study of Mexican history, politics, and economy along with the social and cultural development of México. The class is conducted in Spanish. 3 credits. ADVANCED GRAMMAR Prerequisite: SPN 211; four years of high school Spanish or three semesters of college or equivalent. This course is designed to help students assimilate certain subtle notions of the subjunctive mood in contrast to the indicative, relative pronouns, and prepositions. The course is offered in Spanish. 3 credits. INTRODUCTION TO READINGS IN SPANISH Prerequisite: SPN 212; four years of high school Spanish, and/or three semesters of college or equivalent. This course is designed to help the student improve reading and comprehension skills using readings in Spanish and Latin American texts. The course is offered in Spanish. 3 credits. INTRODUCTION TO LITERATURE Prerequisite: SPN212 or equivalent. This course is designed to provide a general knowledge of Latin American literature. Student learns to be able to distinguish between different literary genres and to analyze techniques of narrative, drama, and poetry. 3 credits. MÉXICO TODAY Prerequisite: SPN 212 or equivalent. This course is an introduction to contemporary México its society; its institutions, history, geography, political and economic system. Discussions focus on art, literature and music in México. Videos and visual aids are a complementary aspect of the course. The course is conducted in Spanish. 3 credits. LATIN AMERICAN STUDIES Prerequisite: SPN 212 or equivalent. This course is designed to develop an understanding of the Latin American countries in their political, economic, social and religious aspects including education, women’s roles, social services and indigenous groups. The class is conducted in Spanish. 3 credits. SPANISH CIVILIZATION Prerequisite: SPN 212 or equivalent. This course is a study of political, social, economic, religious, literary and artistic history from pre-Roman days to the present. 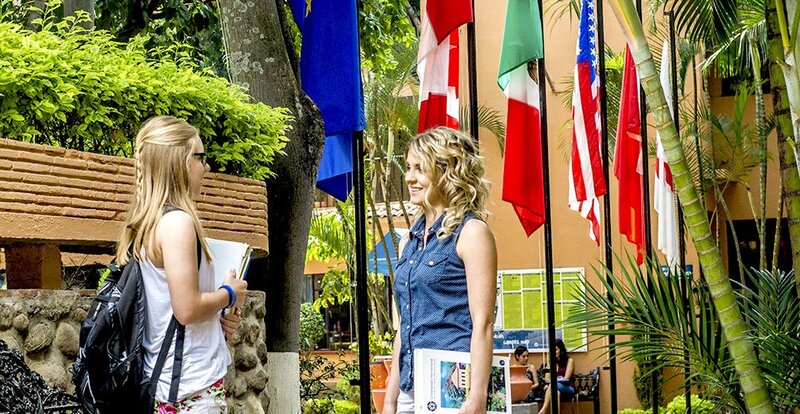 It is designed to provide the student with a comprehensive knowledge of the Hispanic world. The class is conducted in Spanish. 3 credits. SPANISH AMERICAN CIVILIZATION Prerequisite: SPN 212 or equivalent. This course presents the historical, political, social, economic, religious and cultural aspects of Latin America from discovery and the conquest until present time. It especially emphasizes independent Latin America and its reality. The course is conducted in Spanish. 3 credits. SPANISH CONVERSATION I Prerequisite: SPN 212 or equivalent. This course improves Spanish speaking skills through intensive vocabulary building. The practices enhance students’ conversational skills. The class is conducted in Spanish. 4 credits. SPANISH COMPOSITION I Prerequisite: SPN 322 or equivalent. This course improves written communication in Spanish. The course focuses on further development of vocabulary and idiomatic expressions necessary for specific written themes. The class is conducted in Spanish. 4 credits. SPANISH STYLISTICS I Prerequisite: SPN322 or equivalent. This course perfects Spanish grammar, through writing and conversation. Written and oral exercises focus on the organization of ideas, clarity of expression, and the development of logical conclusions. 4 credits. ANALYSIS OF MEXICAN CULTURE Prerequisite SPN 322. This course develops the ability to interpret the historic symbols of the Mexican people. The course is comprised of the following topics: differences between the concepts of pre-Hispanic time and the Gregorian calendar; value and use of time and its ritualization; interpretation and significance of space as a mold for cultural behavior; cultural transformation due to the influence of western culture; the changing sociocultural panorama, its symbols and manifestations in social life; and the manifestation of México's past in its present time. 3 credits. SPANISH FOR BUSINESS Prerequisite: SPN 322; SPN 323 or equivalent. This course is designed for those students interested in the area of business. It concentrates on the following aspects: business vocabulary, writing formal letters, preparation of oral presentations concerning the economic and commercial affairs in various Latin American countries. The course is conducted in Spanish. 3 credits. SPANISH AMERICAN LITERATURE I Prerequisite: SPN 322 or equivalent. The course focuses on the study of Latin American literature from 1492 to 1800. Readings in poetry, prose and drama from the Renaissance, Baroque, Neoclassical and Romantic periods are also included. The class is in Spanish. 3 credits. SPANISH AMERICAN LITERATURE II Prerequisite: SPN 323 or equivalent. The course is a continuation of SPN/LIT 405 course and focuses on Latin American literature from 1880 to the present. The readings are a selected compendium of poetry, prose and drama from the modernists, realists, naturalists and contemporary writers. The class is conducted in Spanish. 3 credits. LATIN AMERICAN SHORT STORY Prerequisite: SPN 323 or equivalent. This course is a comprehensive analysis of selected stories by contemporary authors of recognized significance in their national and international context. The course is designed to improve vocabulary, reading and increase knowledge of regional colloquialisms and idioms. The class is conducted in Spanish. 3 credits. MEXICAN LITERATURE Prerequisite: SPN 323 or equivalent. This course offers an understanding of Mexican literature in its historical, political and social context since its beginning to the present. Students analyze the literary movements in México through the reading of selected works. 3 credits. CHICANO LITERATURE Prerequisite: SPN 323 or equivalent. This course analyzes the historical, political and social elements influencing the Chicano movement and its expression in literature. During the course, students analyze short stories, essays, poems, novels and plays within the Chicano movement. 3 credits. SPANISH FOR SPANISH SPEAKERS II Prerequisite: SPN 320 or equivalent. This course is designed for those students whose mother tongue is Spanish but who have lived and been educated in the United States and have studied Spanish grammar. The course focuses on increasing vocabulary and idiomatic expressions in Spanish. It also reviews general aspects of culture in Latin America. 3 credits. SPANISH PHONETICS AND PHONOLOGY Prerequisite: SPN 322 or equivalent. This course describes and analyzes the sound system of modern Spanish based on structural phonetic theory. The focus of the course is on intensive drilling on the various sounds and sound-variants of the Spanish language to correct problems of linguistic interference. The class is taught in Spanish. 4 credits. SPANISH CONVERSATION II Prerequisite: SPN 322 or equivalent. This course improves and enhances Spanish speaking skills. The course focuses on informal and technical vocabulary for discussions of specific themes. The class is conducted in Spanish. 4 credits. SPANISH COMPOSITION II Prerequisite: SPN 422, SPN 323 or equivalent. This course focuses on formal Spanish composition. The following topics are covered: style, narration and description. The class is conducted in Spanish. 4 credits. SPANISH STYLISTICS II Prerequisite: SPN 322 or equivalent. This course focuses on the analysis and practice of the different modes of formal research. The student will apply the theoretical and practical foundations necessary for the planning, writing and presentation of oral and written speeches in Spanish. 4 credits. ANALYSIS OF THE PSYCHOLOGY OF THE MEXICAN Prerequisite: SPN 322 or equivalent. This course is a general introduction to the principal behaviors of the Mexican "being". It is a consideration of the national identity and a portrait of Mexicans, their personality, values and beliefs. The class is conducted in Spanish. 3 credits. EDUCATIONAL ASPECTS IN MÉXICO Prerequisite: advanced level of Spanish or SPN 322. This course presents the development of themes related to education in México from the pre-Columbian period to the present with emphasis on Mayan and Mexican cultures, religious education, secular and lay education, and also the development of contemporary urban and rural education, Special emphasis is placed on family participation in education and the parent/ teacher relationship. The class is conducted in Spanish. 1-3 credits . MÉXICO TODAY Prerequisite: SPN 212 or equivalent. This course is an introduction to contemporary México, its society; institutions, history, geography, political and economic system. Discussions focus on art, literature and music in México. Videos and visual aids are a complementary part of the course. The class is conducted in Spanish. 3 credits. LATIN AMERICAN STUDIES Prerequisite: SPN 212 or equivalent. This course is designed to develop an understanding of Latin American countries in their political, economic, social and religious aspects as well as education, women, social services and indigenous groups. The class is conducted in Spanish. 3 credits. SPANISH CIVILIZATION Prerequisite: SPN 212 or equivalent. This course is a study of political, social, economic, religious, literary and artistic history from pre-Roman days to present times. It is designed to provide the student with a comprehensive understanding of the Hispanic world. The class is conducted in Spanish. 3 credits. SPANISH AMERICAN CIVILIZATION. Prerequisite: SPN 212 or equivalent. This course presents the historical, political, social, economic, religious and cultural aspects of Latin America since discovery and the conquest until present time. It especially emphasizes Independent Latin America and its reality. The course is conducted in Spanish. 3 credits. HISTORY OF MÉXICO Prerequisite: SPN 211 or equivalent. This course provides a chronological study of the political and economic history of México, as well as its social and cultural development from the pre-Columbian era to the present. Special emphasis is placed on the cultures of Meso America, the colonial period, the Revolution of 1910 and the post-revolutionary period. The class is conducted in Spanish. 3 credits. THE MEXICAN POLITICAL SYSTEM Prerequisite: SPN 322 or equivalent. This course provides a historical analysis of the sociopolitical evolution of México from the Meso America theocracies and the priestly power of the Aztecs, to the power structure of New Spain to the strongmen and dictators of contemporary México. It also deals with the Mexican Revolution, and the return of the military as leaders, the consolidation of the official Party (PRI), pluralist ideology, the opposition, and the control and manipulation of mass communication media. 3 credits. ANALYSIS OF THE PSYCHOLOGY OF THE MEXICAN Prerequisite: SPN 322 or equivalent. The course is a general introduction to the principal behaviors of the Mexican "being". It gives a profile of the national identity as well as a portrait of the Mexicans, their personality, values and beliefs. The course is conducted in Spanish. 3 credits. HISTORY OF RELIGION IN MÉXICO Prerequisite: advanced level of Spanish or SPN 322. This course provides the student with an understanding of Mexican religion with a focus on indigenous, Christian and contemporary Catholic dimensions. The course also addresses repercussions in the political, social, cultural and economic development of México of yesterday and today. The class is conducted in Spanish. 3 credits. INTRODUCTION TO MEXICAN ART Prerequisite: SPN 322 or equivalent. This course is an analysis of Mexican Art, starting from the pre-Columbian friezes, sculpture and architecture, and the pre-Columbian murals, through the Sixteenth Century frescoes and Eighteenth Century Baroque art, to conclude with the great Mexican muralists of the twentieth century. The class is conducted in Spanish. 3 credits. EDUCATIONAL ASPECTS IN MÉXICO Advanced level of Spanish or SPN 322. This course presents the development of themes related to education in México from the pre-Columbian period to the present with emphasis on Mayan and Mexican cultures, religious and secular education, and the development of contemporary urban and rural education. Family participation in education is also considered, emphasizing the parent/teacher relationship. The course is conducted in Spanish. 1-3 credits. INTRODUCTION TO LITERATURE Prerequisite: SPN 212 or equivalent. This course is designed to provide a general knowledge of Latin American literature. The student learns so distinguish between literary genres and to analyze techniques of narrative, drama, and poetry. 3 credits. SPANISH AMERICAN LITERATURE II Prerequisite: SPN 323 or equivalent. The course is a continuation of SPN/LIT 405 and focuses on Hispano-American literature from 1880 to our times. The readings for the course are a selected compendium of poetry, prose and drama from the modernists, realists, naturalists and contemporary writers. The class is conducted in Spanish. 3 credits. LATIN AMERICAN SHORT STORY Prerequisite: SPN 323 or equivalent. This course is a comprehensive analysis of selected stories from contemporary authors of recognized significance in their national and continental contexts. The course improves vocabulary and reading skills so that the student can master regional colloquialisms and idioms. The class is conducted in Spanish. 3 credits. MEXICAN LITERATURE Prerequisite: SPN 323 or equivalent. This course provides an understanding of Mexican literature in its historical, political and social context since its beginning to the present. Students analyze the literary movements in México through the reading of selected works. 3 credits. CHICANO LITERATURE Prerequisite: SPN323 or equivalent. This course analyzes the historic, political and social elements influencing the Chicano movement and its expression in literature. During the course, students will analyze short stories, essays, poems, novels and plays within the Chicano movement. 3 credits. INTERNSHIP FOR MEDICAL PERSONNEL Prerequisite: SPN 212 and courses at the 300 level related to the student's career goal. This internship provides field work experience in a Latin American healthcare setting. It serves as a means to help medical students achieve immediate ability to function in Spanish and to explore cultural similarities and differences affecting communication and Latino groups or individuals. 1-3 credits. INTERNSHIP IN SOCIAL WORK Prerequisite: SPN 212 or equivalent and courses at the 300 level related to the student's career goal. This internship provides a supervised work opportunity within a Mexican private or public social agency in areas pertinent to the student's interests. This experience helps the students to understand cultural variables in Latin-American ethnic groups and how these factors influence social work practice. 1-3 credits. INTERNSHIP IN BUSINESS AND ECONOMICS Prerequisite: SPN 212 or equivalent and courses at the 300 level related to the student's career goal. This internship serves as a means for business and economics professionals to achieve immediate ability to function in Spanish. It provides supervised experience in a Mexican business environment. It also serves as a means to review and improve conversational skills and to master the technical Spanish vocabulary necessary to function successfully in the field. 1-3 credits. INTERNSHIP IN EDUCATION Prerequisite: SPN 212 or equivalent and courses at the 300 level related to the student's career goal. This internship provides an opportunity for observation and teaching in selected private and public Mexican Schools and colleges under the supervision of a classroom teacher and university supervisor. This experience helps participants to gain a better understanding of culturally diverse students and families. 1-3 credits. Please note: Internships in Education are not available during the months of June, July and August due to the fact that local schools are not in session at that time. INTERNSHIP IN HOTEL AND RESTAURANT MANAGEMENT Prerequisite: SPN 212 or equivalent and courses at the 300 level related to the student's career goal. This internship serves as a means for hotel & restaurant management students to achieve an immediate ability to function in Spanish. It provides supervised experience in a Mexican hotel or restaurant environment. This experience also serves as a means to review and improve conversational skills and to master the technical Spanish vocabulary necessary for the student's career. 1-3 credits. INTERNSHIP IN MEXICAN CRIMINAL JUSTICE Prerequisite: SPN 212 or equivalent and courses at the 300 level related to the student's career goal. This internship enables the student to learn the basic operations of a Mexican criminal justice agency and to understand the history and sociology of Mexican culture, Mexican criminal justice system and Mexican criminal law. 1-3 credits. *These courses are only offered during certain times of the year.